Made from durable co-molded rubber, it''s the Halo Spartan Assault Keycap Key Cover! 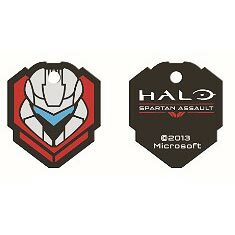 Featuring one side inspired by the cover art for the game Halo: Spartan Assault video game and the other by the game''s logo , the key cover will fit your standard key blank securely. Perfect for any fan of the Halo video game series! Ages 14 and up.